What do you use that little pocket for? The first jeans had four pockets: one back pocket, two in front and that little one half hidden in one of the front pockets. That pocket originated in the days of the Wild West in America, when no man worth his salt would be caught without a pocket watch. The little pocket was developed to house and protect his prize time-keeper. Pocket watches came and went but the little pocket remained. Today it’s known as an outpost pocket, condom pocket, coin pocket or matchbox pocket. 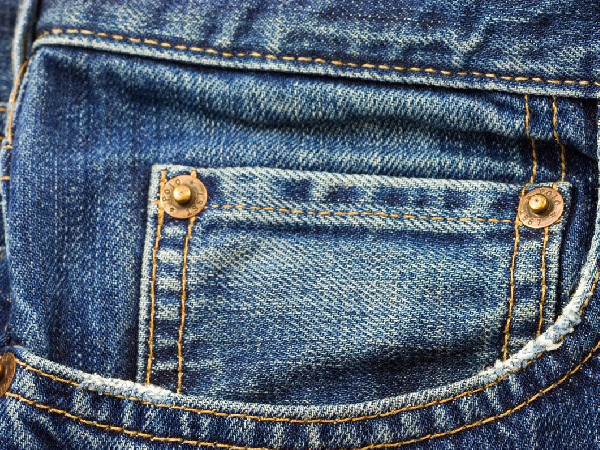 It’s believed that this pocket will remain a feature of jeans design until the day these popular pants no longer exist. Levi Jeans owns copyright on the specific orange colour of the cotton used to finish their jeans. Initially rivets (the little metal fasteners used reinforce the pocket corners and at the bottom of the button fly) were used on all the pockets, but they damaged horse saddles so they were removed from the back pockets. Before rivets were used on jeans, they were used to strengthen stress points on horse blankets. The first label used on an item of clothing was a red flag beside the back pocket of Levi Strauss jeans. Limbo, a boutique in New York, were first to prewash new jeans to give them a weathered look. This style became a hit. In the 1950s jeans were forbidden in schools, theatres and restaurants in America because they were associated with rebellion against conformity. The jeans of male factory workers had a zip fastener in front and those of women workers had one on the side. American soldiers who wore jeans when off duty during World War II did much to popularise them outside America. It requires 37 different needlework processes to make a pair of Levi 501s. The name “denim” comes from a sturdy material that originally came from Nîmes in France.